Wanna roleplay as Batman circa 1967 or 1993? You should probably opt for the PlayStation 3 incarnation of Arkham Origins. During this evening's conference, Sony offered a few new details on the upcoming Arkham Origins - specifically what exclusive baubles might attract people toward the PlayStation 3 version of the game. To put things bluntly, the offerings are geared toward Batman geeks. First up is the classic, 1960s-style Batman skin made famous by Adam West in the campy Batman TV series. You probably can all imagine exactly what this aesthetic looks like, but in case your pop culture senses are busted, just imagine a late-30s, relatively fit actor filling out a lighter version of the Batman costume with all the grace and panache of a bloated William Shatner. 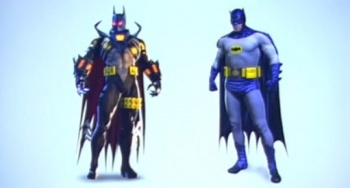 Next is the Knightfall iteration of Batman. The neat thing about this skin is that technially it's not Bruce Wayne wearing the cowl. Instead, the Batman role is filled by Jean Paul Valley, as this incarnation of Batman appeared right after Mr. Wayne's spine was busted in half courtesy Bane's unrealistically violent repertoire of professional wrestling moves. So, Mr. Valley took on the role of the Dark Knight, right up until he proved a bit unstable and a still somewhat broken Bruce had to beat him into submission. That's how problems are solved in comic books. There's currently no pricing or availability info on these skins (beyond their PS3 "exclusivity"), but expect details to emerge soon.